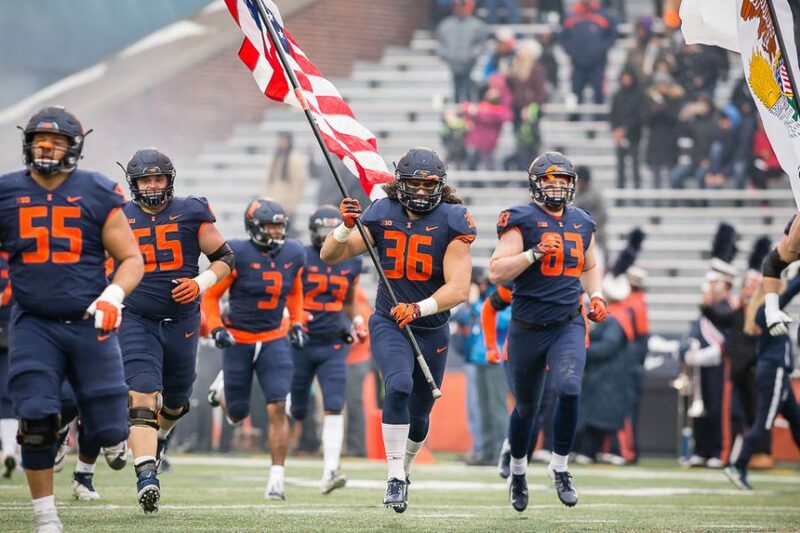 Illinois tight end Austin Roberts (36) carries the American flag onto the field before the game against Iowa at Memorial Stadium on Saturday, Nov. 17, 2018. During the week, Illinois football head coach Lovie Smith called the game against Iowa his team’s playoffs. The Illini followed up the challenge with a 63-0 loss, tying the program’s record margin of defeat, which came in a 63-0 loss at the University of Chicago in 1906. Illinois honored its nine-player senior class prior to the game and actually started out fairly well on the back of senior Del’Shawn Phillips’ interception during Iowa’s opening drive. Starting in Iowa territory, the Illinois offense gained just three yards, turning it over on downs. The Illini wouldn’t make their way into Hawkeye territory until eight drives later, but the game was out of reach by then. In that time, the Hawkeyes strung together five touchdowns, including a strip-and-score after a Ra’Von Bonner fumble inside the Illinois 20-yard line. The Hawkeyes led 35-0 at halftime. Illinois punted eight times, went three-and-out six times and turned the ball over on downs three times. Protecting the football was a major issue for the offense, allowing the Hawkeyes to start drives in Illinois territory six times on the night. Senior linebacker Del’Shawn Phillips said his team didn’t execute in individual battles, something he believes held Illinois back more than anything technically. The Illini also struggled mightily on special teams against Iowa. Blake Hayes, who had two 50-plus yard punts with a long of 62 yards, had a punt blocked, which set the Hawkeyes up in the red zone to score on the next play. At the 13:26 mark in the third quarter, Iowa returned a Hayes punt 61-yards for a touchdown, putting them up decisively, 42-0. The Hawkeyes started with much better field position than the Illini throughout the game, with their average starting spot coming at their own 49-yard line. Illinois gave up 400 total yards, a figure that normally would be a positive for a defense that has now given up an average of 56.3 points per game in its six Big Ten defeats. The last four games alone, Illinois has allowed opponents to score 211 points. Iowa scored three touchdowns with its tight ends, on the back of a 13-for-21 passing performance from Nathan Stanley, something Illinois said it had prepared for during the week. Stanley threw for 178 yards and three touchdowns after the Phillips interception, while running back Mekhi Sargent went for 121 yards and two touchdowns on 17 carries. Conversely, the Illinois offense couldn’t muster any sort of threat. The Illini produced only 231 yards of total offense, going 2-for-17 on third downs. Mostly a positive on the year, the offensive line was unable to provide enough time for quarterback AJ Bush or his receivers to pick out openings in the defense, as Bush was sacked twice and regularly pressured into making poor throws and decisions. In one positive note for Illinois, sophomore running back Ra’Von Bonner rushed for a career-high 111 yards on 21 carries, with a long of 19. The Cincinnati native has set back-to-back bests in the last two games, posting 81 yards on 10 carries at Nebraska last week. Though Bonner had some success, the rest of his team didn’t. Iowa stopped Illinois on eight-straight third down plays from 5:10 to go in the second quarter until true freshman Jakari Norwood carried for an 11-yard gain late in the fourth quarter with the game well out of reach. Phillips was blunt after the game, speaking about his disappointment in the result of his final home game at Memorial Stadium.